Pixar is known for exceptional storytelling and emotionally impactful movies. The teams there have managed to create character after character that has depth, humour, pathos, and relatability. 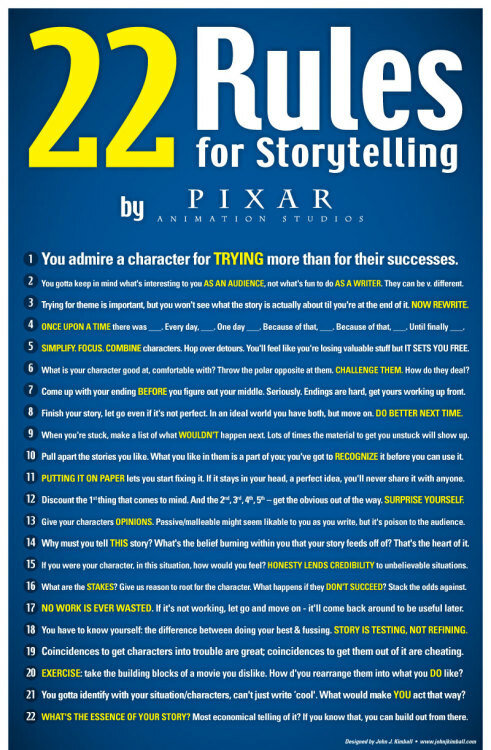 As someone who draws a lot from my experiences in the theatrical world into my editing, I was delighted when I stumbled across this image of 22 Rules for Storytelling by Pixar and thought they were exceptionally relevant for writers of any genre. Click here to return to Another View Editing's Home Page. Content copyright Kim Sheard. Picture Window theme. Powered by Blogger.